Bruce Lane has been helping cities and towns, historical societies, veterans associations, and many other restoration committees restore the beauty of Bronze Statues, Granite Memorials, and Commemorative Plaques for over 20 years. Using the finest craftsmanship available, your restoration project can be safely returned to its original luster. 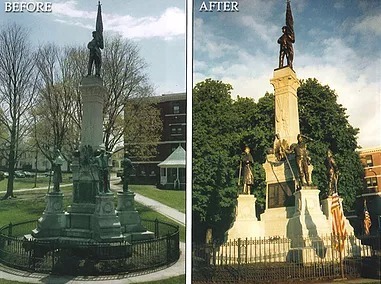 Bruce has restored memorials all along the Northeastern United States and throughout the country. He will personally inspect and advise treatment for each project. He will explain why your Bronze Memorial has deteriorated to green and black colors, and also advise how to maintain your project after restoration or repairs. 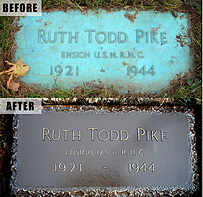 Whether your Bronze Plaque is on a Cemetery Memorial, Statue, Granite Pedestal, or you would like information about ordering a Bronze Plaque for a Memorial or commercial application, it costs you nothing to find out how I can serve you! Protecting your Bronze Memorial or Statue from the natural elements over time is a wise investment after any restoration and beautification project. 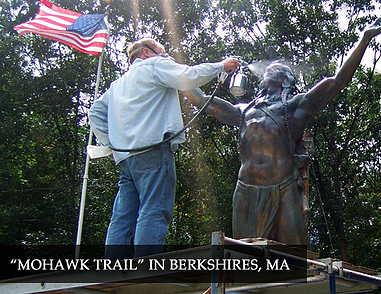 When restoring Bronze Statues or Plaques, there is no job too large or small. Every Bronze Memorial has to be carefully inspected for structural damage and corrosion. After a thorough inspection, I will propose different options that will meet your specifications, and budgetary needs. Cities and Towns have some of the most beautiful Bronze and Granite Memorials and Statues; restoring the Memorial to its natural beauty and original luster is our specialty. Honoring our war heroes is serious business, and we use expert care and craftsmanship restoring and/or designing War Memorials. Many of the Statues and Memorials I work on are over 100 years old and need special care. Paramount to any restoration project is the suggested scheduled maintenance programs Bronze Restorations offers. Protecting your Bronze Memorial or Statue from the natural elements over time is a wise investment after any restoration and beautification project. ​Over the past 20 plus years, I have been involved in many important projects, from the simple to complex. Planning your project is done best with effective communications. I will meet with your boards to answer any questions, and consistently keep you informed of your project's progress. Many cities and towns plan for restoration projects to be completed for an upcoming event, and dates book quickly. Portions of projects can be completed at different dates to meet your deadlines. If you wish to have your project completed now for a future event or celebration, contact us immediately to begin the consultation and bidding process. ​Please call with any questions you have. I understand the value and love many folks have for their Memorials, and look forward to working with you on your restoration project. 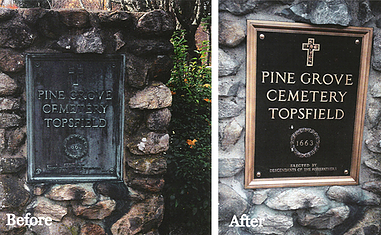 Whether it's Bronze, Granite or Marble, we take great pride in restoring old monuments to their original beauty. Contact me through the 'Get a Free Quote' page so we can make arrangements to view your project on site. The process may be a simple one, or it could be a very involved restoration. As we chat, and ask questions over the phone, I'll be better able to determine what your professional restoration project needs are.